The biggest event of the year in downtown Cambridge, Maryland! 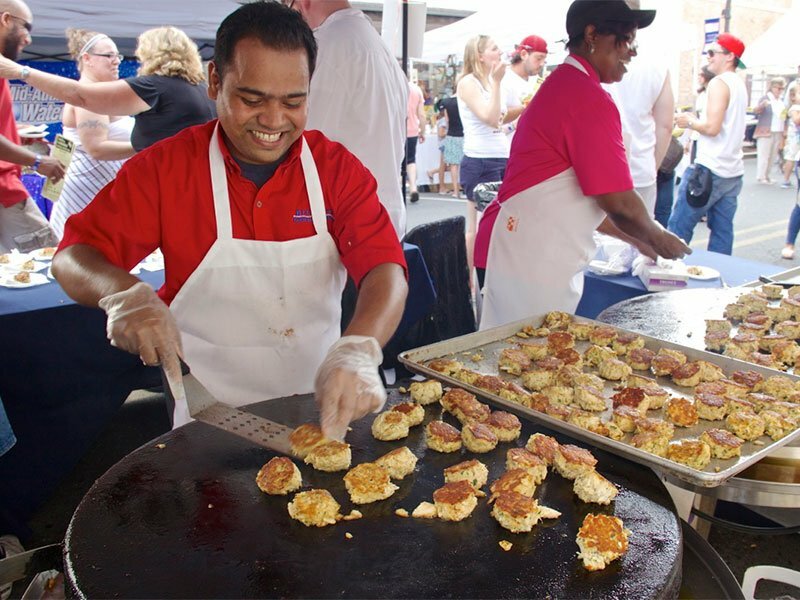 Come out and enjoy a free street festival with a crab cook-off, music, kids’ activities, a professional crab-picking competition, gallery openings, late shopping, and more. Entry to the festival is free; tickets are required to taste the dishes in the Crab Cook-Off. This outdoor festival happens rain or shine from 5 to 10pm on Saturday, July 13, on Race and Poplar Streets in Historic Downtown Cambridge, MD. Purchase a ticket to taste all entries in the Crab Cook-Off competition that has local top chefs competing in categories such as best crab soup, crab dip, and crab specialty dish – and then cast your vote for your favorites. It’s recommended to buy tickets for the Crab Cook-Off in advance because it often sells out. Tickets will be available for sale online through DowntownCambridge.org. If you don’t care to take part in the Crab Cook-Off, there will be plenty of food vendors, and local restaurants will be open. There will be live music. July 13 is also Second Saturday, so shops and art galleries will be open into the evening with specials and free receptions. Taste of Cambridge runs from 5-10pm. Details at DowntownCambridge.org. The event benefits the downtown revitalization work of the nonprofit Downtown Cambridge.